Since 2009, Latrobe Valley Casual Relief Teacher Support Network (LVCRTN) has existed to give Casual Relief Teachers (CRTs) an opportunity to discuss and learn about issues vital to education. CRTs are employed in all schools sectors on a casual basis. CRTs come from a variety of backgrounds and experiences. Some have been teachers for many years and decided to just do the odd day here and there. Some are returning to work after an absence; they may be parents with children who desire to keep their teaching current. Some have not worked in the profession for long and are seeking experiences or a contract or long term employment in the schools sectors. Various funding models to assist CRTs to obtain quality professional development (PD) have come and gone since LVCRTN first began. The Victorian Institute of Teaching (VIT) in conjunction with the Victorian governments of the day have shown some commitment to the cause over the last 9 years. Currently a project contract is held by the Teacher Learning Network, a professional learning body developed by the Australian Education Union and Independent Education Union and CRTs have been able to access limited local PD and online PD through the CRTPD.com website. While this has enhanced the variety of PD, our local group, LVCRTN, continues to meet in the ETU Building where the AEU is a resident on a monthly basis. There we share experiences and discuss educational issues using a variety of resources eg local knowledge and skills of teachers and principals and CRTs, groups like AMAZE (Autism, aspergers) or AMUSE (Australian Music Educators), Art Galleries, Historical Villages, etc. 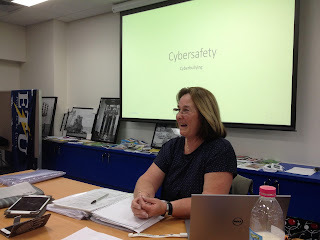 At our last meeting on September 13th Karen Mackay, who is our very capable Honorary Secretary, sourced some excellent materials about Cyber Bullying and Cyber safety. Karen gave the group handouts of the slides and other materials, including resources. The group participated in a couple of activities, shared experiences ad discussed issues. All agreed the presentation had been worthwhile and gave them ideas and resources to pursue further. One of the best websites is: https://www.esafety.gov.au/ where there is a wealth of resources for CRTs to access and use. Karen Mackay speaks on Cyberbullying and Cybersafety at LVCRTN meeting.